This story originally appeared on Bustle.com. When I was 13 years old, my family was invited to an event at the local Hindu temple. Unfortunately, I just so happened to have my period that day. Expressing concern, my mother told me I really shouldn't be going to the temple while on my period. When I asked her why, she replied, "Because women are considered impure during menstruation." She ultimately let me come anyway, realizing that the logic was absurd. But my inner feminist was still pissed. 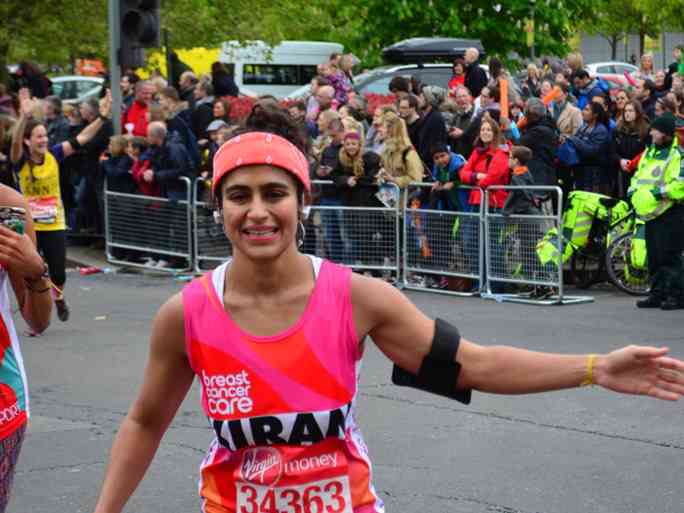 After Kiran Gandhi ran the London marathon while bleeding freely (in other words, she did not use any feminine hygiene products), she set the Internet on fire, as people debated whether she was "disgusting" or a hero. And I get it. Blood (or any other bodily secretion, like pee or poop) isn't exactly considered pleasant. It can carry disease. It's messy. It can smell. But to call her "disgusting" is to miss the point. What a lot of people in the West do not understand is that in India, not only do women not have access to tampons or pads (forget about menstrual cups), but they are also often shamed for even having a period in the first place. Gandhi, who is of Indian descent, is speaking for all the women who've experienced period shaming -- and she's even experienced it, too. "I was working at my desk at Interscope and had two tampons on my desk. A female co-worker walked by and told me to put those away. I was baffled," Gandhi says. When my mother, who was born and raised in India, first got her period, she was given a prompt set of rules. Don't touch anyone. Don't go to gym class. Don't cook. Rags were to be disposed of separately from everything else, so as not to "taint" anything. When she finally switched to pads, she was forced to buy them wrapped in a brown paper bag to shroud them. However, my mother was lucky. She was college-educated, city-dwelling, and raised in a middle-class household. Unfortunately, many of the women experiencing period shame don't have it as easy. Women (many of them coming from rural and uneducated backgrounds) are taught that they are dirty, impure, or even cursed. Menstruating women are often not allowed to cook, eat with family members, or handle any religious items. Some women are even sent to a separate area of the house, not allowed to leave until their cycle is over. To add to the problem, women must wash and dry their dirty rags without anyone finding out. They are often too embarrassed to dry them in the sun, and thus dry them in secret -- underneath other clothes, under thatched roofs, in closets -- where the rags do not get disinfected. The women are then faced with infections that they often can't afford to treat. Ironically, even when one Indian man, Arunachalam Muruganantham, tried to find a solution by creating a machine to make low-cost sanitary napkins for lower-income women, he was ostracized by his community. People called him possessed, or simply crazy. And it's not just India. To varying degrees, women around the world experience period shaming. In an interview with The Wall Street Journal, world-famous sushi chef Jiro Uno said that women can't be sushi chefs because their palates supposedly become imbalanced during menstruation. According to Unicef, in Bolivia, women are instructed not to dispose of their pads with other garbage, lest they develop cancer. Lest you think period shaming is not a problem in the West, let us not forget Donald Trump's recent sexist comment about Megyn Kelly regarding blood coming out of "wherever." Then there's the litany of sexism that comes with PMS jokes. God forbid a woman should have an opinion or a mood that alters from 100 percent happy. Years after the temple incident, I was at Staples making copies when I realized I was about to have a major accident and had forgotten my tampons at home. I asked my then-boyfriend to go next door to the drugstore and pick up a box of tampons while I waited for my copies. He went to store, but he didn't buy tampons. He bought cigarettes and soda, but tampons? Too embarrassing for him to buy. Period shaming is real. It exists. What Kiran Gandhi did is totally punk rock. An act of bravery and heroism, Gandhi stood up for the millions of women who do not have a voice and shed light on an issue that many people still do not understand. Next time you toss that tampon down the toilet, think about how you don't have to hide in a dark room, how you're allowed to eat with others, and how you're not considered dirty or impure. Because you're one of the lucky ones.